406 mm/50 Mk73 х 3 pcs. 20 mm Oerlikon Mk2029 х 2 pcs. 40 mm Bofors Mk218 х 4 pcs. Missouri — American Tier IX battleship. Missouri was first released for sale worldwide on 7 December 2016, and was removed from sale on 28 February 2018 with the release of Update 0.7.2. 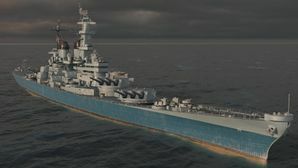 Affectionately referred to as "Mighty Mo" by her crew while she was on active duty, USS Missouri comes to World of Warships as the game's first Tier IX premium. She has many similarities with her counterpart in the American battleship tree tech tree (Iowa) but with a few key differences. The primary difference is that Missouri carries the Surveillance Radar ( ) consumable instead of Spotting Aircraft ( ) or Catapult Fighter ( ). This completely changes her play style, allowing her to aggressively support capture areas and help her team's destroyers to win battles in those areas. She is especially dangerous to British cruisers and Tier VIII premium Mikhail Kutuzov, as the radar allows her to penetrate their smoke screens and catch them off guard with a well-aimed salvo of armor penetrating shells. Other than the radar, her other combat characteristics are similar to Iowa, with powerful super-heavy AP rounds, high speed, and good anti-aircraft suite. She does have a thicker forward armor bulkhead, but — just like Iowa — it can still be reliably penetrated by Yamato’s 18.1-inch shells. Missouri’s other significant difference from Iowa is her status as a premium ship. This means she earns extremely large amounts of credits — 1 million credits per match with a premium account is easily achievable in an average-to-good battle, with 1.5 to 2 million credits being possible if all modifiers are stacked in a really good battle — and experience, as well as being able to train American ship captains. The only downside to Missouri is her 750,000 Free experience cost — which equates to 30,000 to convert — making her extremely expensive. Whether she is worth this cost is up to individual captains, but few players who have invested in her regret the decision. Shares the same pros as Iowa. Improved forward bulkhead protection over Iowa. Has access to the Surveillance Radar ( ) consumable, active for 35 seconds with a 9.45 km range. Very good at making credits. A good match with all credit modifiers and premium time can bring earnings of a million or credits more. Shares the same cons as Iowa. Very high ship price: requires 750,000 Free XP which also equates to 30,000 if one chooses to convert their ship experience. Unable to mount either Spotting Aircraft ( ) or Catapult Fighter ( ). Lacks the enhanced Repair Party of Iowa. Missouri only heals the standard 0.5% per second or 14% total per charge, compared to 0.66% per second or 18.48% total per charge for Iowa. As a premium ship, Missouri doesn't have any upgrades to research. Slot 1: This slot is most commonly filled with Main Armaments Modification 1 ( ), though Auxiliary Armaments Modification 1 ( ) is a popular pick for captains who go for a full AA build with other upgrades and commander skills. Slot 2: There's really one choice for battleships here: Damage Control System Modification 1 ( ). This will reduce chances of fire and flood. Slot 3: There are several good options to pick from. AA Guns Modification 1 ( ) will boost her AA strength, while Secondary Battery Modification 2 ( ) will boost the range and accuracy of secondaries instead. Artillery Plotting Room Modification 1 ( ) will increase range and give secondaries a slight boost in range and accuracy, but may be a weaker choice than the other two. Slot 4: Steering Gears Modification 2 ( ) is recommended and will reduce rudder shift time. Captains with fire problems could also consider Damage Control System Modification 2 ( ), reducing the amount of time on fire and conserving hit points. Slot 5: Maximizing stealth is never a bad choice. With the Concealment Expert commander skill, Concealment System Modification 1 ( ), and appropriate camouflage, this ship can choose when to engage the enemy. Slot 6: The recommended choice is Artillery Plotting Room Modification 2 ( ) to give guns more accuracy; this will make it so that at ranges of ~12-13 kilometers, the battleship is exceptionally accurate, much more so than contemporaries. Main Battery Modification 3 ( ) will improve damage-per-minute, and may surprise a cruiser who still expects the battleship to be reloading. Just like the Upgrades mentioned above, the Commander Skills can be specialized to confer to a particular build/play-style. For Level 1, the recommended pick is Priority Target; Preventative Maintenance can also help keep critical modules — such as engines and turrets — functioning despite critical damage. At Level 2, High Alert or Expert Marksman are the best choices available; High Alert is recommended for captains more focused on the traditional survivability build for battleships. Level 3 presents a number of good options. Superintendent is an excellent pick in order to have extra charges of Surveillance Radar ( ) and Repair Party ( ); Basics of Survivability will reduce the impact of fires and floods and keep Missouri in the game longer; Vigilance helps offset Missouri’s lack of aerial help in detecting incoming torpedoes; Basic Firing Training makes an already punishing AA suite even more so. For Level 4, Advanced Firing Training is the best choice, and Manual Fire Control for AA is an option for her already-potent anti-aircraft suite. Captains could also invest in Concealment Expert to reduce her already excellent detection ratings even further, or Fire Prevention in order to minimize the amount of fires and fire damage Missouri will suffer. The major differences between Missouri and Iowa are found in the former's consumables: Missouri has no Catapult Fighter ( ) or Spotting Aircraft ( ), but is granted access to Surveillance Radar ( ) instead. As a high-tier battleship with excellent money-making capabilities, captains are strongly encouraged to equip Damage Control Party II ( ), Repair Party II ( ) and Surveillance Radar II ( ) on their Missouri at all times... she will make more than enough credits back to justify the investment. As a premium ship, Missouri comes included with Type 10 camouflage that lowers her detection radius, reduces the accuracy of incoming shells, and increases the amount of experience she earns. It should be noted that Missouri has two different Type 10 camouflage schemes to choose from; the only difference between them is their appearance. Furthermore, both Type 10 camouflage provides a 100% bonus to experience earned in battle, not the usual 50%. Missouri’s signal loadout should focus on two objectives: maximizing her credit earnings and maximizing her survivability. Wyvern ( ), India Bravo Terrathree ( ), and Zulu ( ) will help with the former, while India Delta ( ), India Yankee ( ), and Juliet Yankee Bissotwo ( ) will help with the latter. Sierra Mike ( ) is worthy of consideration for captains who enjoy flexing Missouri’s 33+ knot speed, while November Foxtrot ( ) and November Echo Setteseven ( ) will help reduce her consumable cooldowns and further enhance her AA suite. Missouri proudly rests in the Hawaii port. Missouri steams alongside her sister ship Iowa. An enemy Amagi class battleship challenges "Mighty Mo". Missouri and Iowa double team an enemy New Orleans-class cruiser. Three (3) Vought OS2U Kingfisher float planes, two catapults. USS Missouri at sea in her 1980s configuration. The Iowa-class battleships were designed in 1938 when the U.S. Navy proposed a new class of battleships that were to develop on the lessons learned from the development and construction of the North Carolina-class and South Dakota-class of battleships. Of exceptional concern were the Kongo-class battleships that were able to use speed to harass convoys and outgun fast aircraft carrier escorts, as well as the refusal of Japan to disclose details regarding the construction of the Yamato-class battleships. Wishing to have an apt and equal response, the construction of the Iowa-class was approved. These factors culminated in the U.S., Britain, and France invoking the "Escalator Clause" of the second naval treaty, which permitted 16-inch guns and 45,000 long tons standard displacement. With the emergence of aircraft carriers and the need to protect them from surface threats, the concept of “fast battleships” came into prominence; ships designed with the speed and the endurance to keep pace with carrier groups and serve as a major deterrent to surface attack. To fulfill this role, the design called for a top speed of 33 knots from 8 boilers connected to 4 turbines; each turbine to a propeller shaft. This layout produced a total of 230,000 shaft horsepower. Furthermore, the ship had a greater waterline length-to-beam ratio, making the ship longer than its predecessors, as well as notably faster. The main armament of the Iowa class — while using rifles of the same diameter of 406mm as preceding ships — were longer than the rifles on the South Dakota-class (increased from 45 calibers to 50 calibers) and therefore have the distinction of being the largest rifles mounted on any US warship to date. This increase in rifle length resulted in greater distance for expanding gases in the chamber to propel the projectile, which equated to higher muzzle velocity, greater range, and greater armor-penetration capabilities than preceding rifles. Furthermore, the Iowa-class had a comprehensive suite of secondary and anti-aircraft guns due to the design emphasis of increased protection against air attacks; the armament systems were supplemented with state-of-the-art radar-based fire control systems (Missouri mounted the Mark 27 Fire Control Radar set). The Iowa-class battleships had the characteristic “all-or-nothing” armor scheme seen in preceding American battleships, with the thickest armor around the citadel between Turrets A and Turret C. The outer hull plate was 38mm Special Treatment Steel (STS) and the side armor of 307mm was angled at 19-degrees inwards in order to confer greater armor thickness for little additional weight; this was especially advantageous against shells from longer range. The hull has a triple bottom under the citadel to protect against underbottom explosions. The armor scheme of the Iowa class was largely the same as the preceding South Dakota class, which offered protection from 406mm/45 rifles firing 1,016 kg Mark 5 shells from ranges between 16,000 - 27,000 meters. As the second pair of Iowa-class battleships built, Missouri and Wisconsin had some armor differences from the first pair, Iowa and New Jersey: forward bulkhead armor thickness increased to 368mm to better protect against head-on rounds. This is noteworthy when facing enemies bow-on in World of Warships. USS Missouri was the third ship of the Iowa-class, laid down at the Brooklyn Naval Yard on 6 January 1941, launched on 29 January 1944, and after a few months of sea trials, commissioned on 11 June 1944. Missouri has the distinction of being the last battleship commissioned into the US Navy. Missouri was completed and launched in June 1944. She would spend five months in trials before sailing to San Francisco where she would be destined for a fleet flag. Leaving in December 1944, Missouri arrived in the Caroline Islands where she joined Task Force 58 in January 1945. From January to March 1945, TF 58 would conduct raids against Tokyo, Yokohama, and Iwo Jima. March 1945 would see Missouri again taking part in raids against Japan itself. On the return trip, Missouri provided naval gunfire support for the invasion of Okinawa through the month of May. While off Okinawa, Missouri was struck by one Kamikaze and another scored a near miss. Both attacks resulted in minor damage. In May 1945, Missouri became the flagship of the Third Fleet joining Task Force 38 in further support of the Okinawa Campaign and additional strikes against Japan in June. Other following raids would constitute the remainder of Missouri’s wartime service, and shore bombardment became commonplace. On the 2 September 1945, the official surrender of Japan was signed aboard Missouri while she was anchored in Tokyo Bay. Missouri would then sail for New York. She remained in active service after the war, the only battleship to do so, and participated in training exercises through 1949. In August 1950, Missouri was re-based to Japan in preparation for coastal operations during the Korean War. Missouri spent the remainder of the year and a portion of the following year providing fire support for landing troops. Following this, she briefly returned to Norfolk Navy Yard to receive refits before returning to Korea in late 1952. She continued coastal operations until she again returned to Norfolk Navy Yard for additional refits in early 1953. Following the completion of her modifications, Missouri conducted training operations through February 1955 before being placed in the Pacific Reserve Fleet where she would remain until her reactivation in 1984. In October 1984, the battleship was towed to the docks at Long Beach, California where she would undergo a major refit before her re-entry into service. During this overhaul, she received Tomahawk and Harpoon missile systems. Missouri was officially recommissioned on 10 May 1986 and joined her sister ships in conducting coastal operations during the Gulf War, most notably conducting bombardments near Kuwait City. 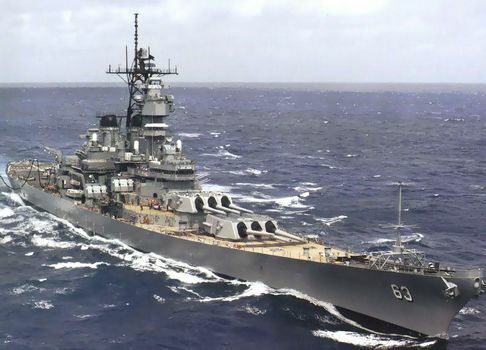 Following the end of the Cold War, Missouri was again decommissioned and stricken on 12 January 1995. She was placed back in the Pacific Reserve Fleet in Bremerton, Washington until 1998 when she was towed to Ford Island, Hawaii in preparation to make her a museum ship. In 1999, Missouri — now adjacent to the Arizona Memorial in Pearl Harbor — opened to tourists and continues her service today as a historical reminder of the end of the battleship era. Missouri is depicted in her Korean War configuration. Her paint scheme had no camouflage by the 1950s. Launching of USS Missouri, 29 January 1944. Commissioning ceremonies aboard USS Missouri, 11 June 1944. A kamikaze plane about to hit Missouri, 11 April 1945. Missouri transfers personnel to Iowa in advance of the Japanese surrender ceremony, August 1945. The formal surrender of the Japanese Empire being signed aboard Missouri, 2 September 1945. Commemorative marker on the deck of USS Missouri, marking the precise spot where World War II was formally ended on 2 September 1945. Missouri transiting the Panama Canal, October 1945. Missouri shelling North Korea near Chong Jin, 21 October 1950. Missouri in dry dock during her modernization at the Long Beach Naval Shipyard in 1985. Re-commissioning ceremonies aboard USS Missouri, 10 May 1986. Missouri undertaking an underway replenishment with Kitty Hawk from the MSC ship USNS Kawishiwi, circa 1986. Missouri firing her 16-inch guns during Operation Desert Storm, 6 February 1991. USS Missouri today, as a museum ship in Pearl Harbor, Hawaii. Missouri facing the sunken Arizona. Plaque commemorating the surrender of Japan to end World War II. Missouri accepts tourists on a beautiful day in Pearl Harbor. Missouri guards the USS Arizona Memorial at Pearl Harbor. A view of the Missouri while departing the USS Arizona Memorial. This page was last modified on 19 February 2019, at 05:51. This page has been accessed 94,306 times.